Our most popular colors have been standardized for easy use and are available as masterbatches or precolors in 12 different engineering resin systems. 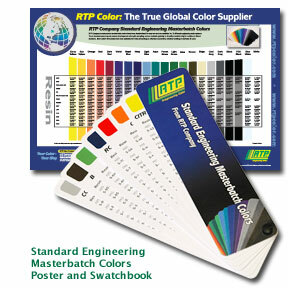 These standard colors speed product development with quick sampling, and are available globally to simplify manufacturing in multiple or distant locations. Each color’s formulation has been optimized to make processing as effortless as possible whether molding or extrusion is used. RTP Color also develops custom color masterbatches in these and many other polymers that are compatible with all molding and extrusion processes. Please contact one of our Color Account Managers or your local RTP Company Sales Engineer to begin developing a custom color for your application.